For most people, feelings of worry or anxiety happen every now and then and are part of a healthy emotional range. Such feelings can serve us well by warning us of potential danger and helping us ‘gear up’ for performance. However, sometimes these feelings remain long after the ‘threat’ or stressful situation has subsided and escalate into an unwanted problem, becoming what is known as ‘anxiety’. According to the National Survey of Mental Health and Wellbeing conducted by the Australian Bureau of Statistics (Summary of Results, 2007, 4326.0, Canberra) anxiety is the most common mental health condition in Australia. The results showed that on average, one in four people will experience anxiety at some stage in their life and in a twelve-month period, over two million Australians will experience anxiety. Children, as well as adults, experience anxiety—whether it is a response to particularly challenging circumstances or a generalised, free-floating habit of worry for no apparent reason. When it becomes an intense, prolonged experience, anxiety can be excruciating and even debilitating. Selina Byrne, M.A.P.S., once had a client, a young boy, who had unpleasant feelings that his parents and she thought would be anxiety-related. But for him, he was used to the feelings, didn’t think much about them, and just went on with his life. So they agreed there was no need to change anything as long as he wasn’t bothered by the feelings! Many people start thinking about those feelings, though, and get worried. They talk inside their heads about the ‘awful’ feelings and how to ‘get rid’ of them. Strangely, the more we focus on anxiety and how to remove it, the more we build fear of the feelings, which can make them more frequent or intense. Teaching all children to manage worry, find ways to distract and soothe themselves, challenge their thinking and self-talk is very important. These are essential ‘resilience’ skills. As a publisher of therapeutic tools for children and adults, Innovative Resources hopes that Anxiety Solutions for Kids cards will help lay a foundation of wellbeing for children. We are delighted to have co-created this tool with author, Selina Byrne M.A.P.S. and artist, Katie Jardine. We hope that children (and parents) will enjoy experimenting with the activities and discovering that there are things they can do when old Worrywart drops by and outstays the welcome. HI, will you be running training about anxiety in children and how to use the anxiety cards? We will certainly consider it, and happy to discuss further. 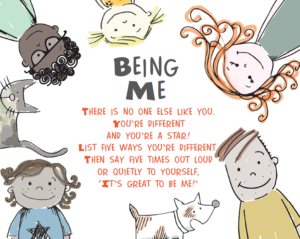 Hello, this product comes as a card set and can be ordered by going the the Anxiety Solutions for Kids page on our website and adding it to your shopping cart. There are links to this page in our article.